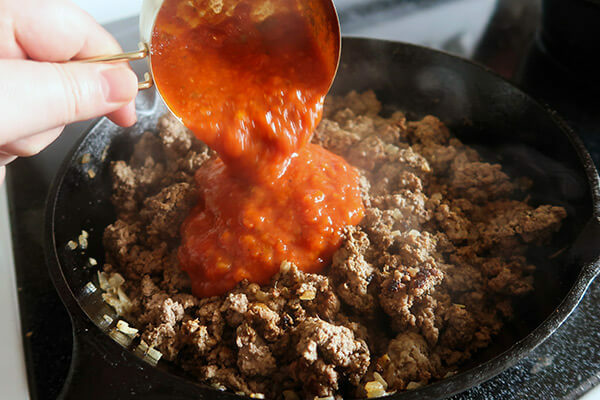 Bolognese sauce is a basic, but mighty, meat based sauce that is typically used for pasta’s and lasagna. 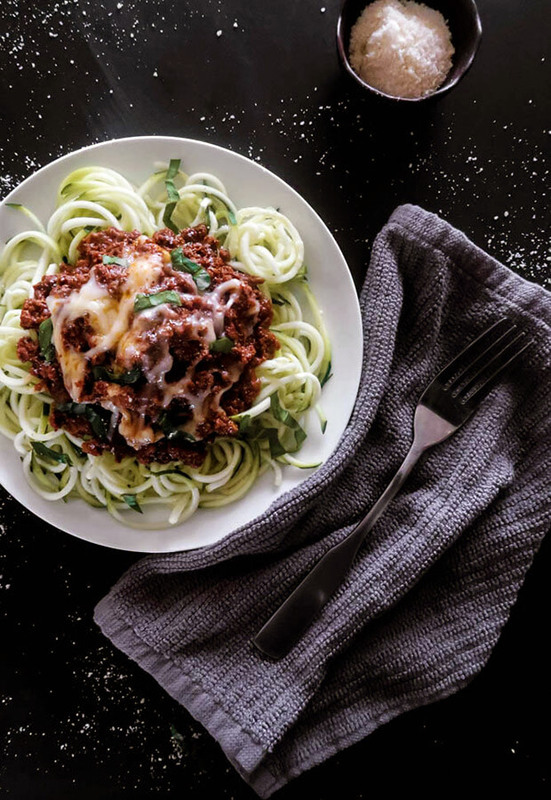 The secret to a delicious bolognese is a seriously long cook time and just the right temperature. My recipe is relatively easy with just a few spices, and Rao’s tomato sauce. If you cannot find Rao’s, then look for a pasta sauce that is free from added sugar. 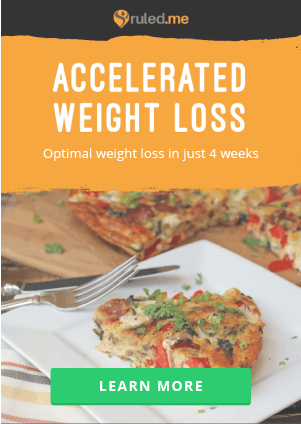 While I’m calling for the marinara, I’ve also tested this recipe with their cheese flavor and it was equally as delicious! 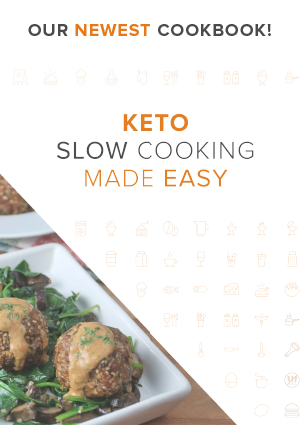 Instead of asking you to stand watch over a bolognese for several hours, we’re going to make things easier by transferring the sauce to a slow cooker. 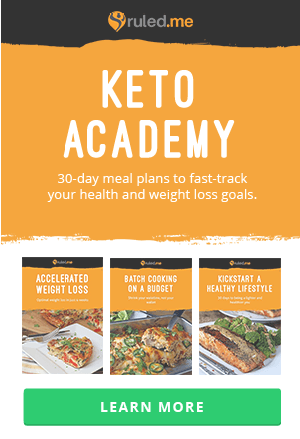 It’s best to start in the morning so that your sauce is ready before dinner time, but you can make a batch the day before and store in the fridge until the next day. Once the sauce is ready – the casserole is a breeze! It will only take a few minutes to put together. 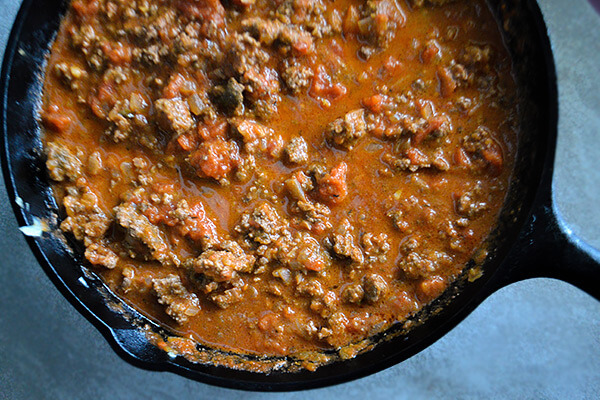 If you want to tell everyone that you spent the whole day slaving over this bolognese – well, I’ll keep your secret! By the way, bolognese freezes well. 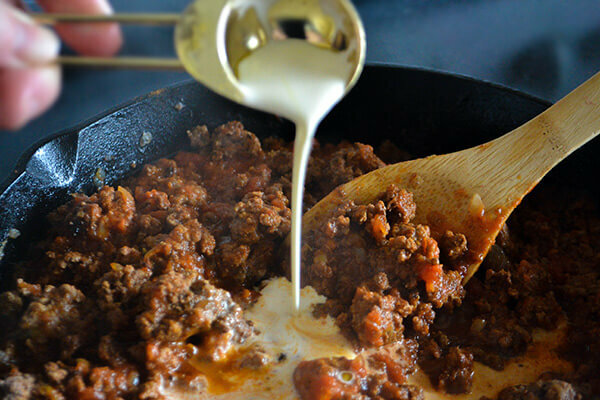 Make a double, or triple, batch and you can have bolognese on hand any time you’d like. 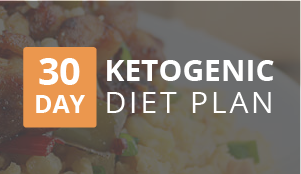 This is a great recipe for prep day. I recommend serving this with our breadsticks, or maybe even a reverse seared rib eye steak. 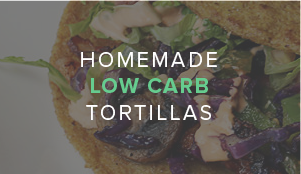 I hope this will be your new weeknight favorite! 1. 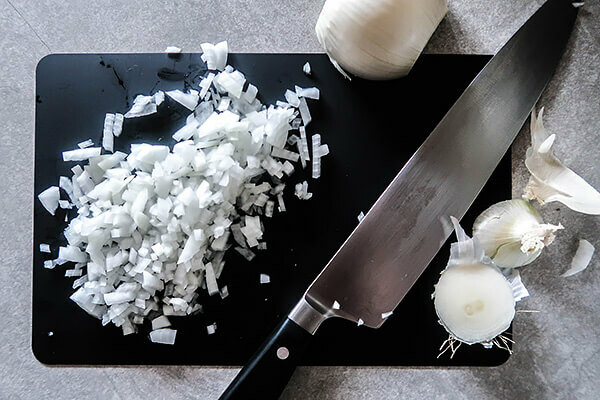 Preheat a skillet over medium heat, and set your slow cooker onto “low.” Finely dice half of a medium sized white onion while you wait for the skillet to heat up. 2. 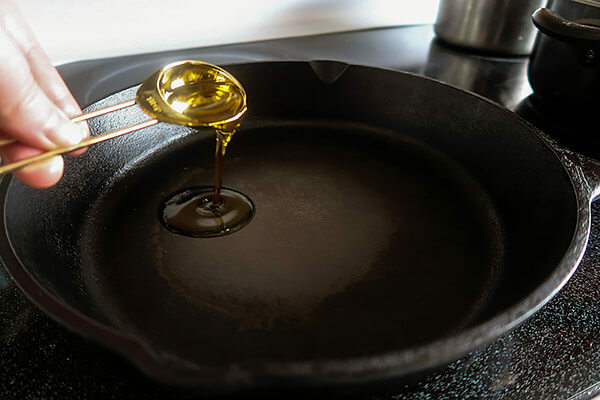 Add olive oil to the frying pan. 3. 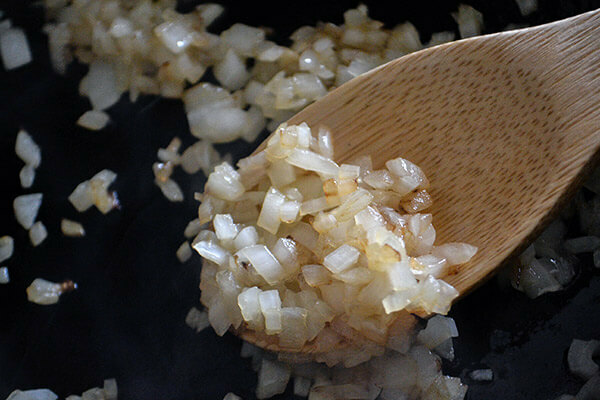 Once the oil becomes hot, add the diced onion. Cook until the onions start to become translucent and pick up a bit of color. 4. Stir in the minced garlic cloves. 5. 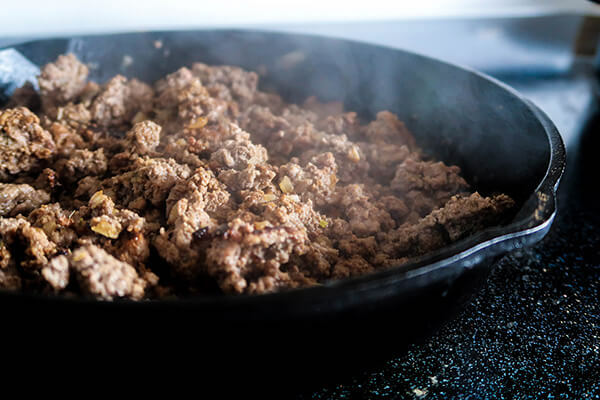 Crumble the ground beef into the pan. Don’t worry too much about breaking up the chunks as they cook. Everything is going to fall apart in the slow cooker anyway. 6. Add in ½ a teaspoon of thyme, ½ a teaspoon of nutmeg, ½ a teaspoon of marjoram, and black pepper to taste. 7. Mix everything together and allow the beef to cook until it has mostly browned. 8. Mix in 2 cups of Rao’s basil tomato marinara sauce. 9. Stir in the 2 tablespoons of heavy whipping cream. 10. Finish the sauce by mixing in ¼ of a cup of chicken bouillon. 11. Turn the heat off and allow the sauce to rest for about 10 minutes before transferring it into the preheated slow cooker. Be careful not to pour hot sauce into cold stoneware. I’ve cracked them before! 12. Cover the slow cooker and allow the sauce to simmer for 8 hours. Stir occasionally to prevent burning. When the sauce is ready it will take on a deep color and the house will smell like lasagne. After the sauce has finished cooking you can season with additional salt if needed. 13. Preheat your oven to 350°F. 14. 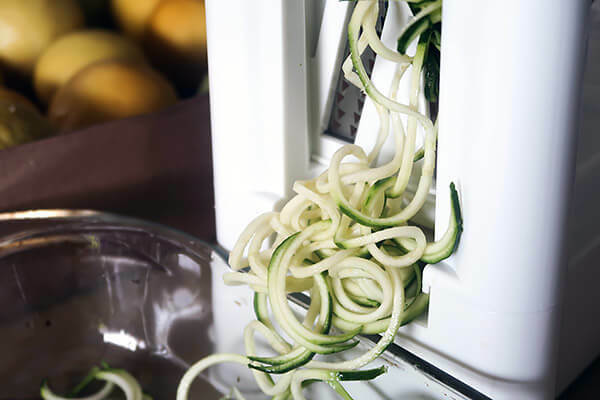 Set up a vegetable spiralizer. 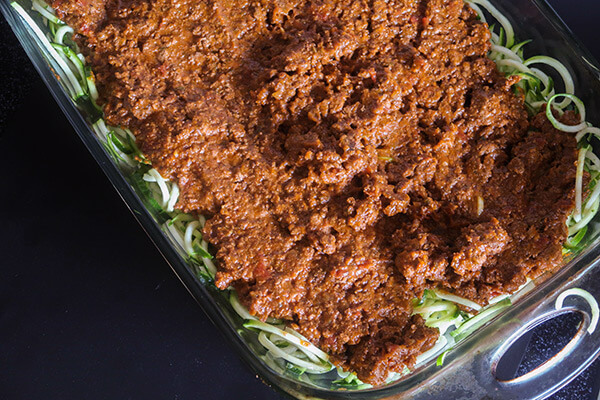 Use it to process the zucchini into noodles, and place the noodles in a casserole dish. Break apart the longer strands so that none of them are too long. 15. Add 2 tablespoons of olive oil to the noodles. Season to taste and then mix together. 16. 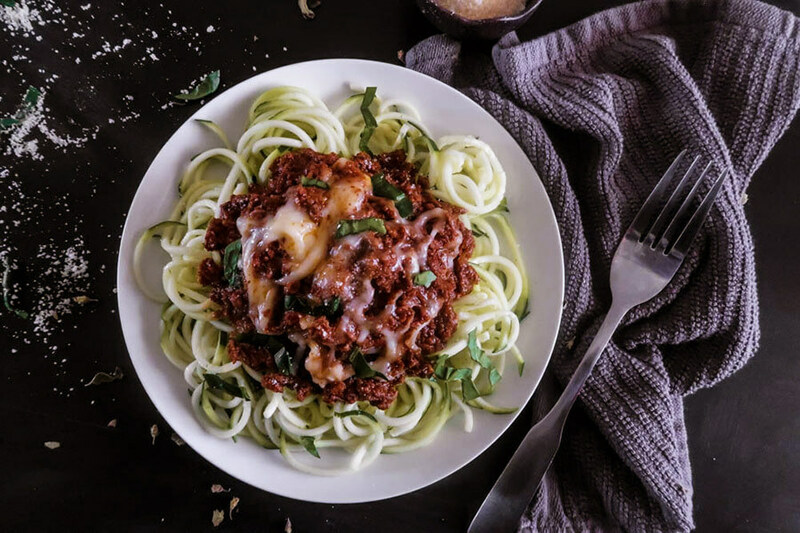 Spread your bolognese sauce over the top of the zucchini. 17. Top the casserole with 1 cup of shredded mozzarella cheese. 18. 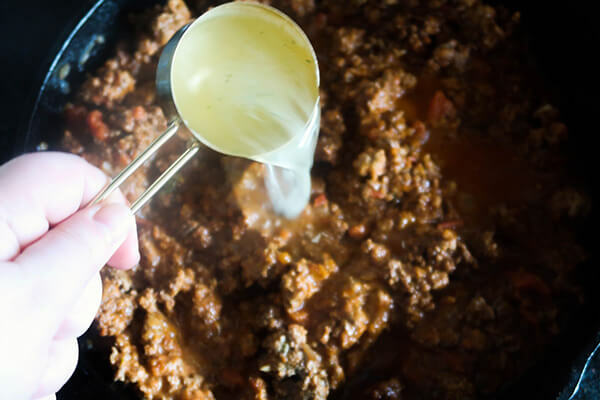 If baking right after cooking the bolognese sauce, then you will only need to heat the casserole in the oven for 15-20 minutes. If you’ve made the sauce ahead of time and it’s been chilled in the refrigerator then you will need to bake for 30-35 minutes. 19. Garnish with fresh basil if desired. 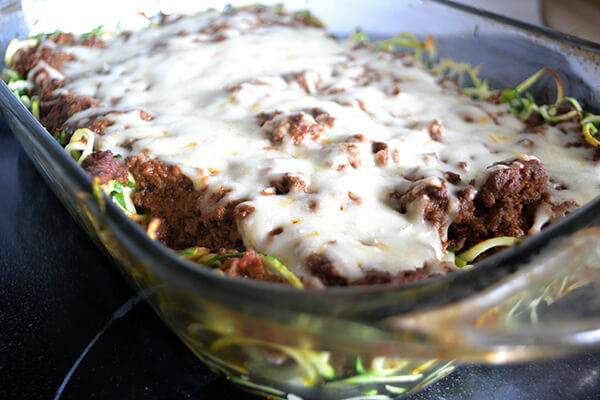 This makes a total of 6 servings Bolognese Zoodle Bake. 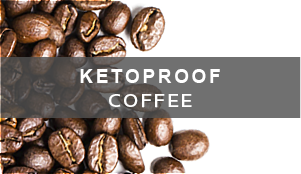 Each serving comes out to be 402 Calories, 28.7g Fats, 6g Net Carbs, and 29g Protein. 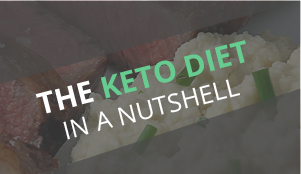 Preheat a skillet over medium heat, and set your slow cooker onto “low.” Finely dice half of a medium sized white onion while you wait for the skillet to heat up. 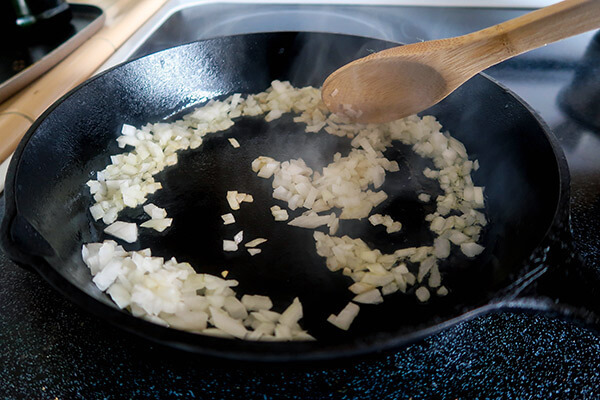 Once the oil becomes hot, add the diced onion. Cook until the onions start to become translucent and pick up a bit of color. Add in the minced garlic cloves. 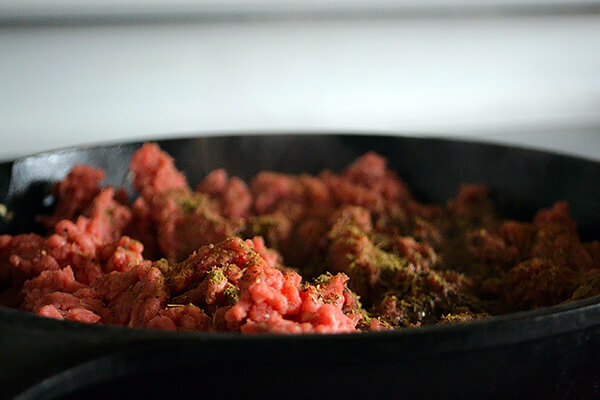 Crumble the ground beef into the pan. Don't worry too much about breaking up the chunks as they cook. Everything is going to fall apart in the slow cooker anyway. Add in ½ a teaspoon of thyme, ½ a teaspoon of nutmeg, ½ a teaspoon of marjoram, and black pepper to taste. 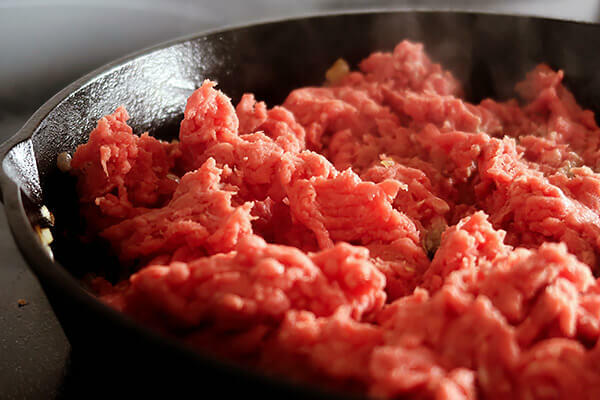 Mix everything together and allow the beef to cook until it has mostly browned. Add 2 cups of Rao's basil tomato marinara sauce and stir into the beef. Stir in the 2 tablespoons of heavy whipping cream. Finish the sauce by mixing in ¼ of a cup of chicken bouillon. Turn the heat off and allow the sauce to rest for about 10 minutes before transferring it into the preheated slow cooker. Be careful not to pour hot sauce into cold stoneware. I've cracked them before! Cover the slow cooker and allow the sauce to simmer for 8 hours. Stir occasionally to prevent burning. When the sauce is ready it will take on a deep color and the house will smell like lasagne. After the sauce has finished cooking you can season with salt if needed. Set up a vegetable spiralizer. 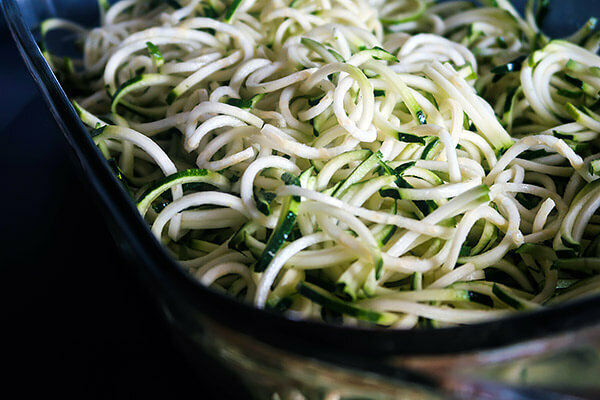 Use it to process the zucchini into noodles, and place the noodles in a casserole dish. Break apart the longer strands so that none of them are too long. Add 2 tablespoons of olive oil to the noodles. Season to taste and then mix together. 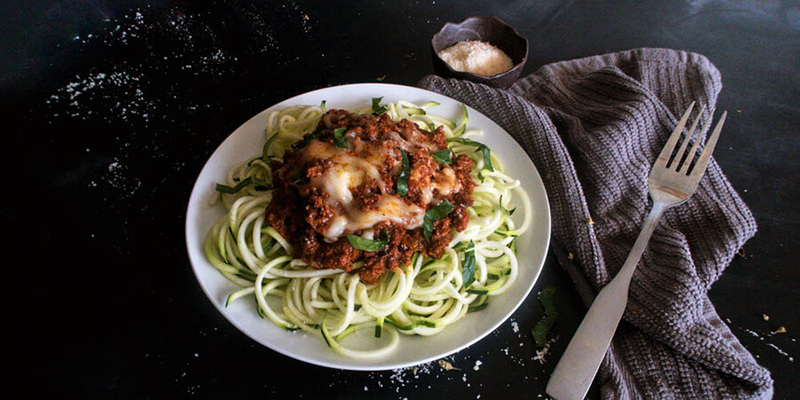 Spread your bolognese sauce over the top of the zucchini. 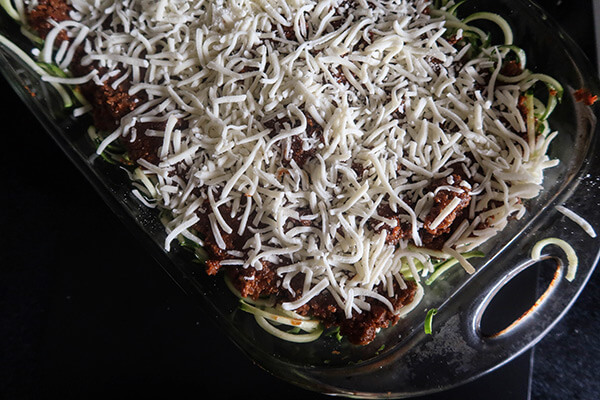 Top the casserole with 1 cup of shredded mozzarella cheese. 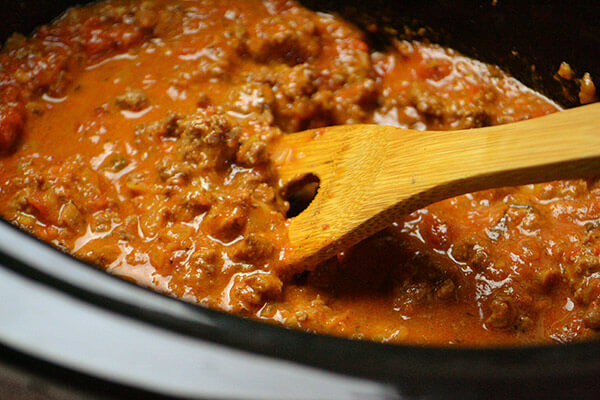 If baking directly after cooking the bolognese sauce then you will only need to heat in the oven for 15-20 minutes. If you've made the sauce ahead of time and it's been chilled in the refrigerator then you will need to bake for 30-35 minutes.